I was a bit surprised to see the DVD of The Cove in my mailbox, in its Netflix wrapper. The selection was courtesy of my wife Hitomi, who is Japanese and often a bit peeved at how foreigners routinely condemn or misrepresent Japanese culture. If the Japanese are hunting these animals sustainably, humanely, and it is their cultural tradition, then who are we to argue? At least, I would feel a bit hypocritical being a meat eater to condemn others for eating meat as well. So, I disagreed with the premise that "hunting dolphins is wrong." More than disagreeing with the hunt, I had more issue with the hypocritical behavior of the Japanese who were trying to hide the slaughter. Why not let themselves be photographed or filmed during the slaughter? If they are truly proud of what they do, then they have nothing to be ashamed of. Including nationalists who are trying to block the screening of the film. I did agree that people should not eat the meat, for health reasons. I find it reprehensible (but not surprising) that the government of Japan would permit schools to serve whale meat in school lunches. 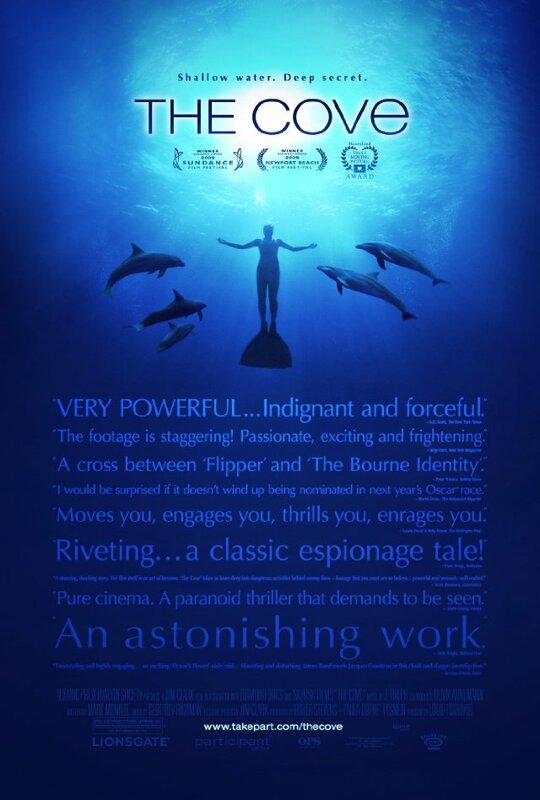 I wish the filmmakers spent more time trying to talk to people in Japan, and of the town of Taiji. Mostly they spent their time talking to incorrigible bureaucrats and officials. Though I love to see bureaucrats squirm when they lie and get caught. I hear the original documentary filmmakers are going to create a follow-up to talk about the good sides of the town. There was a ridiculous extra feature about Mercury in vaccines supposedly linked to the rise of autism. This entry was posted in Uncategorized and tagged japan, taiji, the cove. Bookmark the permalink.